A LARGE crowd is expected in Derry city tomorrow evening for the month's mind mass for Bishop Edward Daly. The service will be celebrated at St Eugene's Cathedral in the city centre on Saturday at 7.30pm. 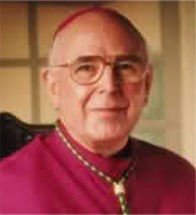 The Fermanagh-born bishop (82) died on August 8 following a battle with cancer. His passing prompted a huge outpouring of sympathy across the city and beyond. World leaders joined ordinary citizens in mourning the death of the cleric who was best known for his bravery during Bloody Sunday in 1972 and his efforts to promote peace thereafter. A spokesperson for Derry City and Strabane District Council today told Inishowen News that the book of condolence for Bishop Daly will be officially closed this weekend. She said there had been a "phenomenal" response as thousands of people visited the city's Guildhall to sign the book and pay their respects in the past four weeks. Mayor of the city, Cllr Hilary McClintock added: “Bishop Daly touched the lives of thousands of people and his kindness, compassion and love for this city and its people will be fondly remembered for many years to come. "I would like to thank everyone who took the time to sign the book of condolence and look forward to presenting it to the bishop’s family on behalf of the people of the city and district."